Being forced to experience a new food scene because you accept a job two counties away has been an unanticipated perk for this working foodie. After hours events, lunch meetings, etc have all meant getting to experience restaurants that would have probably flown under my radar with Baltimore and Washington D.C. also vying for my epicurean attention. Last week I got the chance to have lunch at The Highland Inn with my Mom, who had an afternoon to spare for a leisurely trip to Howard County. The restaurant is the newest project from Chef Brian Boston, the 2011 Restaurant Association of Maryland's Chef of the year and the current Executive Chef/Partner at the highly regarded The Milton Inn in Sparks, MD. (No I didn't know any of this before I walked into the restaurant.) I was attracted to their regard for local and seasonal ingredients. We were seated in a bright, sun-lit dining room and promptly welcomed by our server. After we had a chance to glance over the menu, our server helped us navigate a little more. He excitedly gave us his recommendations and was very helpful as we narrowed down our mid-day meal choices. Ultimately the summer tomato won out. I ordered a heirloom tomato and watermelon salad with goat cheese, watermelon vinaigrette and plumped cherries (dried cherries that have been reconstituted.) Mom ordered the Tomato Gazpacho that also had lump crab, creme fraiche, and a ton of herbs. That bowl was incredibly flavorful and more hearty than most gazpachos I've come across. I also ordered a side of the grits with smoked pork belly and lobster (because good grits are in fact irresistible) and Mom ordered a grilled chicken wrap for us to share. Well after some bread and our tomato laden first courses we were already feeling pretty full if you can believe it. We split half of the wrap (which was very tasty) and got a few large spoonfuls of the heavenly grits down before it was time to ask for the "take home to Dad" box. If you're ever in the vicinity, The Highland Inn would be a worthy stop for a meal. 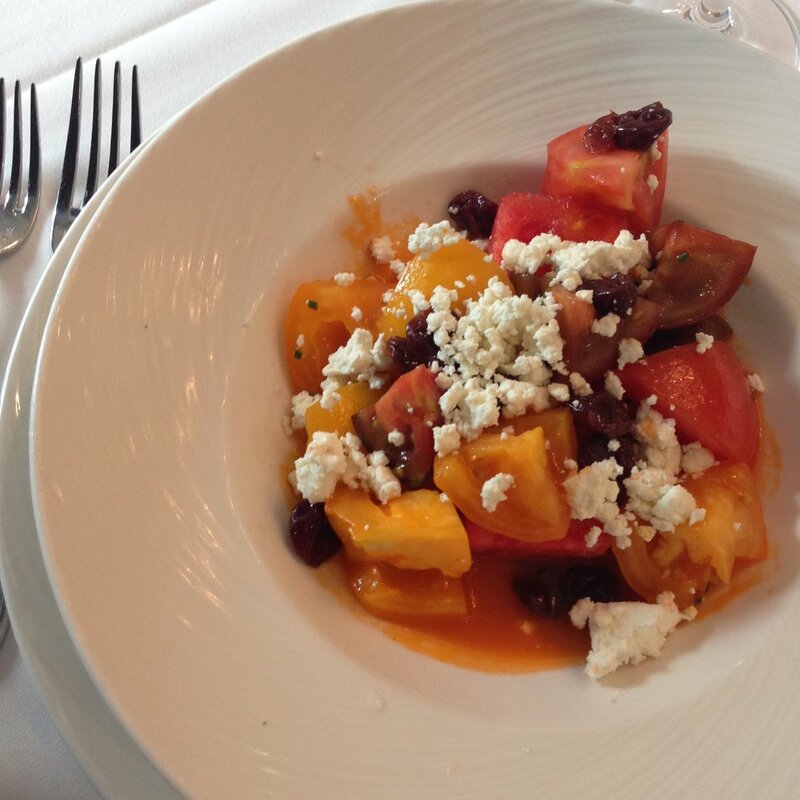 I'm also fairly certain Howard County Restaurant Weeks is going on now through August 4 and both the salad and gazpacho are on the restaurant's well priced, three course special dinner menu.